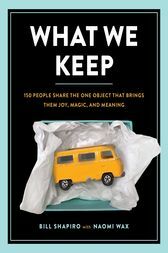 With contributions from Cheryl Strayed, Mark Cuban, Ta-Nahesi Coates, Melinda Gates, Joss Whedon, James Patterson, and many more--this fascinating collection gives us a peek into 150 personal treasures and the secret histories behind them. All of us have that one object that holds deep meaning--something that speaks to our past, that carries a remarkable story. Bestselling author Bill Shapiro collected this sweeping range of stories--he talked to everyone from renowned writers to Shark Tank hosts, from blackjack dealers to teachers, truckers, and nuns, even a reformed counterfeiter--to reveal the often hidden, always surprising lives of objects. Bill Shapiro is the former editor-in-chief of LIFE, the legendary photo magazine. Later, he was the founding editor-in-chief of LIFE.com and won the 2011 National Magazine Award for digital photography. He is the author of several books including the best-selling book Other People's Love Letters. He lives in Brooklyn, New York.